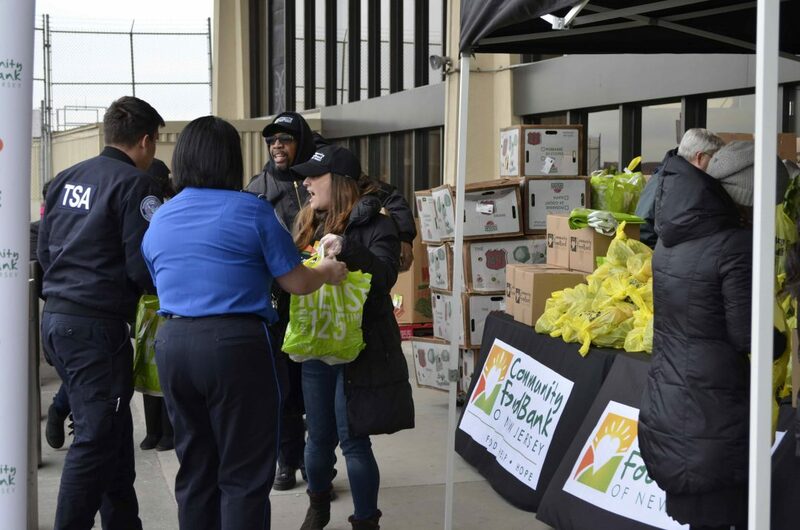 On January 23, the Community FoodBank of New Jersey held an emergency food distribution outside of Terminal C at Newark Liberty International Airport to assist the airport’s federal workers, many of whom were forced to work without pay during the government shutdown. FoodBank staff and volunteers from Stop & Shop gave out fresh produce and boxes of healthy nonperishables to more than 380 Transportation Security Administration (TSA), Federal Aviation Administration (FAA), and U.S. Customs and Border Protection (USCBP) employees. Members of the FoodBank’s SNAP Outreach team also helped to facilitate SNAP applications for more than 60 workers in need of additional assistance. James Wallace, a TSA agent, was one such federal worker in need. “It’s a struggle because I have no money for food, no diapers for my kids,” he told us. James went on to describe the stack of unpaid bills sitting on his kitchen counter at home, saying that without his paycheck, he and his wife had been skipping meals to feed their four young children. Crying tears of relief, he received an allotment of food from two FoodBank staff members. “I feel so lucky because now I have food for the house,” James said. James was far from alone. Christian, another TSA agent, also came to the FoodBank’s emergency distribution with concerns about how he would pay his bills. As new homeowners, Christian and his wife didn’t know if they’d have enough money to pay their mortgage for next month. Federal workers like James and Christian missed two paychecks during the government shutdown. In many cases, they were forced to choose between paying for medicine or food. 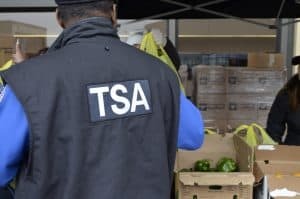 Federal employees at the airport went home with fresh tomatoes, peppers, lettuce, pasta, cereal, canned chicken and tuna, just to name a few items—enough food to help sustain their families as the shutdown dragged on. The distribution was made possible with support from some of the FoodBank’s philanthropic partners, including Stop & Shop, NJ State AFL-CIO, and Wakefern Food Corporation. Hunger remains a pressing issue despite the government temporarily reopening. The shutdown brought to light what we at the FoodBank have long known – millions of Americans are just one missed paycheck away from needing assistance to make ends meet. Many federal workers who typically support the FoodBank faced hunger for the first time in their lives, turning to our network of food pantries to put meals on the table as they emptied their savings accounts or racked up credit card debt to make ends meet. In addition, there is an ongoing concern that 730,000 people may run out of important food assistance by the end of February because of the early disbursement of benefits.